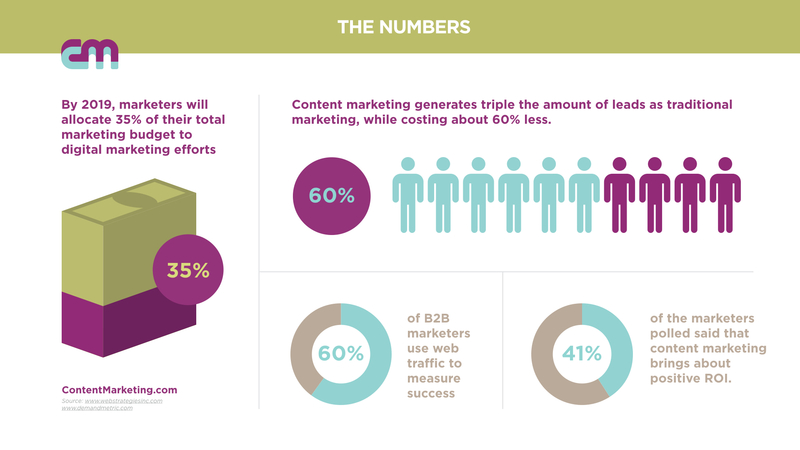 41% of Content Marketers Show Positive ROI – What’s the Real Impact of Your Content​? All content is not created equal. To figure out the real impact of your content marketing efforts, you need to go beyond SEO traffic, tweets and shares. Leading influencers and marketers in content marketing look at a variety of ways to measure the real impact of your content success. 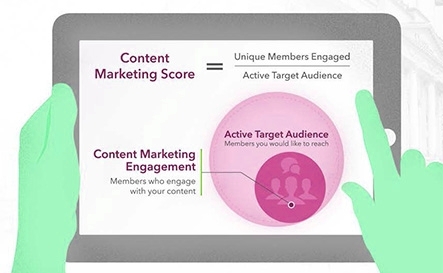 Jay Baer of Convince and Convert wrote last year about targeting a variety of metrics in four key areas – consumption metrics, sharing metrics, lead generation metrics and sales metrics. Each of these is important on their own, and matter greatly to a marketer. ROI is super important to all marketers. In fact, according to last year’s State of Inbound Marketing report, some 41% of the marketers polled said that content marketing brings about positive ROI. In another study, marketers will likely allocate 35% of their total marketing budget to digital marketing efforts by 2019, if not sooner. Forbes Magazine interviewed key business leaders about what content marketing ROI means to them. Answers touched on direct conversions generating dollars and cents, anecdotal responses from new leads, and building trust with new customers. But what about other metrics, like email newsletter subscribers? Are those numbers showing growth? How’s your blog subscriber list? Are your SEO rankings showing increases too? Individually, these numbers give you some indicators to share with your team, and gauge your progress. But they don’t tell the whole story. Taken together with data tools, all of these metrics can show the real strength of your content marketing efforts. Let’s take a look at how to accomplish this. Page Views: In a nutshell, is your content attracting new views to your website or blog? How many views are particular posts getting? In Google Analytics, you can check these simple measurements on a daily, weekly or monthly basis. Within several months, you should be able to see which type of content is showing some traction. Average Time on Page: Google Analytics can also show you how long an average user spent on a particular blog page, consuming the content there. If you are producing and promoting good meaty content, then this metric should be able to offer good direction to your continuing content marketing efforts. Social Shares: As you promote your content on your social feeds, you should be able to use tools like Buzzsumo to track your social shares frequency and dispersion across networks. Marketers can track different types of content, like infographics, blog posts, guest posts, articles, video and more. Content Comments: Does your content attract enough visitors and influencers to have plenty of comments for each new piece of content? Comments really prove your content’s engagement levels, and can lead to many more content topics for future needs. Calls-to-action/Conversions: This is where the rubber really meets the road, folks. Are your calls to action for your content leading to direct sales on your pages? Can you point to particular content of infographics, videos, blog posts or Q and A’s as the leading reason for increased sales during a particular period? If you can, then you’ll gain C-suite approval for content marketing as a key business driver, rather than a tactical part of marketing. Here’s a bonus to great content marketing – when you create great content consistently, you start to see signs of what’s called compounded ROI. The first 30-60 blog posts, infographics or Q&As you do on your site may not yield much ROI at first, but over the course of 3, 6 and 9 months, you’ll notice the difference. You’ll see the comments, you’ll count the numbers of shares, and you will find that your engagement time with readers and influencers is growing. That’s the compounded effect of solid content delivered over time. The ROI is the tangible win. Remember, great content must come first. You can have the best analytics package in your industry, but if your content is underperforming, your ROI will suffer. Do what you can to analyze potential content with three questions: Will your content…. Lower your overall marketing costs? generate leads and build sales? Answering those questions will be the first step on your way to great content and increased ROI. 41% of the marketers polled said that content marketing brings about positive ROI. In another study, marketers will likely allocate 35% of their total marketing budget to digital marketing efforts by 2019. Dave Murrow is a business communications executive and writer-editor-social media expert, specializing in creative approaches to content marketing projects and social media campaigns. You can find his published work in the Phoenix Business Journal.